Looking for best cookbooks of 2014? We have short listed the the best cookbooks for food lovers. We have hand picked the best selling cookbooks to bring the best cooking recipes to you. It is a fact that cookbooks make life easy for people who are learning to cook or like to make fancy dishes at home. With continuous demand of these books, the number of cookbooks that are available in the market is increasing. 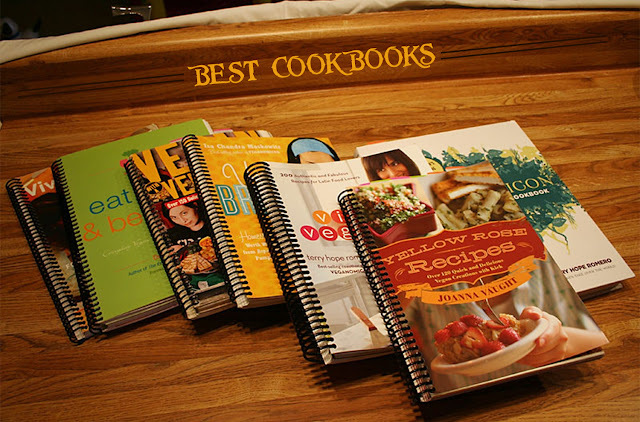 2014 best cookbooks enable you to cook every dish from simple to gourmet recipes in an easy way. However, the level of the skill required to read and follow any cookbook also differs as per the skill of the cook. So, it is necessary for the customer to check and browse the book before purchase. The best cookbooks of 2014 cater to an infinite variety of culinary recipes, depending on the type of cuisine, the level of culinary skill that a reader has and the type of food. Here, in this article, we offer you information about some of the best cookbooks of 2014 that are available on the shelves. This is one of the best cookbooks for 2014 that enables you to elevate your culinary skills. This cookbook offers more than 100 vegan recipes for the people who are vegetarian or who want to adopt a healthy lifestyle. The author of this book has also included various tips about shopping within budget. When it is a matter of flavorful and easy recipes that will also enable you to lose weight, this is the best cookbook 2014 that is available in the market. The author offers 150 recipes that are tasty as well as contains low-calories for people who want to eat normal food and yet would like to lose unnecessary weight. With easy and step by step process of making food and 100 fantastic photos, this book can be a collector’s item. This 2014 cookbook is from one of the most prominent and best-selling authors, who is back with more than 100 paleo recipes for the readers. She offers a fantastic collection of dairy-free, gluten-free and paleo friendly recipes for readers who do not like to include gluten or dairy products in their diet. The other readers can also occasionally cook and enjoy these tasty recipes as a change of taste. This cookbook of the year 2014 is the latest offering from the bestseller author, Yotam Ottolenghi for readers and professional cooks. In this book, he offers more than 150 vegetarian recipes for readers. These recipes emphasize the use of bold flavors, seasoning with a variety of the vegetables and various types of spices that one can stack in one’s kitchen. This is one of the best fall 2014 cookbooks that offer a novel approach for newbie cooks. This book offers extensive information about preparation of ingredients when making any dish, whether it is simple, fancy or complicated. Further, it also offers information regarding the unique history behind certain famous dishes, also an illustrated step-by-step cooking process, so that inexperienced cooks are not confused. The main idea behind the publication of this book is to offer the heritage cooking of the South for new as well as established cooks. There are various categories in this food such as comfort food, the food that you normally cook at home and eat, or high-end restaurant food that is fancy. Moreover, the author offers his own version of various dishes such as Crispy Pig Ear Lettuce Wraps or Chocolate Alabama Stack Cake. As more and more people are leading a busy lifestyle, they would like to have recipes that can be cooked fast but also should be tasty as well as nutritious. The writer of this book offer tested recipes that fulfill all the conditions and use fresh ingredients in an efficient way. The legendary baker who has many bestsellers to her credit is back yet again with new recipes for people who have a sweet tooth. This cookbook offers completely new recipes for sweets that include breads, pastries, candies, cookies, tarts, pies and cakes. The author also offers useful tips, plan-ahead’s for newbies and detailed instructions for each recipe. The author has put her passion and expertise in every recipe of the book. This cookbook is the result of collaboration between two most respected and insightful Paleo powerhouses who offer grain and gluten-free Paleo recipes that have delectable and bold flavors from their kitchen. Both have combined their expertise to bring the cooking experience at a new and the original level. This cookbook offers full-color photos with tricks, tips and enjoyable anecdotes from these culinary mavericks. The author of bestseller book, "Vietnamese Home Cooking," writes yet another sensational book on Vietnamese cooking. The recipes given in this book is a wonderful combination of sophisticated, familiar and rustic. The recipes given in this book is comfortable and very well-suited for any home kitchen. The ingredients are very easy to find when you visit an Asian market. This cookbook is one of the most brilliant and minimalist accounts of the thrill experienced in the restaurant cooking. It tries to simplify the preparation of restaurant food and makes it easy for home cooks to produce elegant and classic recipes in their kitchen. The author of this book offers more than 250 recipes in different sections with 250 colorful photographs of delectable dishes. The author of the book was trained in Paris for baking sweet and enjoyable desserts. Now, as the owner of one of the best bakeries in New York, he is the creator of extremely delicious as well as popular desserts for customers. Now, he has written this cookbook to share his secrets about transforming the most common ingredients into the most satisfying, tempting and extraordinary pastries. If you love fresh seasonal food of the Pacific Northwest, this cookbook is perfect for your kitchen. This book offers French cuisine with personal seasonal menus such as a fall picking party, Wild food dinner and Fourth of July Crab Feast for the admirers. The home cooks will cherish as well as appreciate the simple but elegant recipes such as Harissa-Rubbed Roasted Lamb. The author of the bestseller book, Around My French Table has come up with yet another fantastic view of French food. This time, she targets French desserts for the worldwide readers. This book offers a fascinating mix of the contemporary recipes with original creations that are based on regional as well as traditional specialties. The author has drawn from her experience that includes travels all over the country and market visits. This cookbook offers various tools and techniques that can be used for a successful barbeque at home or anywhere. The author also offers a great repertoire of 300 recipes to dazzle family members and show off to other people. This is the latest book of the author after the bestseller book, Joy of Cooking for guys and is a perfect choice for men, who would like to barbeque for their family with competence and confidence. Italian food is famous for its tasty flavors all over the world. Now, this cookbook offers detailed information about how to find and enjoy the best Italian food. This book offers comprehensive knowledge about basic secrets of Italian food such as how to assemble an antipasto platter and how to use Pantry flavors. In addition to that, this book offers more than 100 recipes that you can create in your kitchen. The author of this cookbook has cooked for present US President, Barack Obama. A charismatic TV host, he has captivated many food lovers with his brilliant culinary interpretations of various dishes. In this book, he offers many dishes that he personally makes for his wife and the friends. The recipes given in this book offer a blend of rainbow flavors for the readers such as Swedish, Ethiopian, Caribbean and Mexican among the others. This is one of the most inspiring and uproariously funny books from the chief editor of Food and Wine Magazine. This is an account of her ineptitude in the kitchen and various incidents when she learns to cook from the greatest of the celebrity chefs. The author offers 100 recipes that are ideal for home cooking and her interpretation of that recipe. In his debut book, the author offers a priceless view of the background scene of a 4-star restaurant, when any customer gives an order from the food menu. This book has all the action, drama, triumph and disaster of real chaos in any restaurant kitchen with an intimate view. There are very few books that focus on this aspect of running any restaurant.